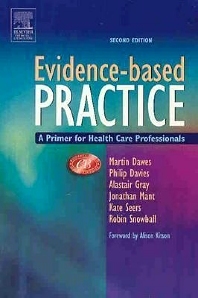 The book is a comprehensive guide to all the main strands of EBHC - finding and implementing evidence for use in clinical practice. Its focus is health professionals in the primary care field, and it consciously uses case examples from a variety of professional contexts. Examples and questions relevant to primary care practice are featured throughout the text. It discusses principles as well as practice, and provides guidance for teachers. 3. Finding the evidence: an information skills approach. 4. Introduction to critical appraisal. 6. Studies assessing diagnostic tests. 7. Case series and reports. 12. Critical appraisal of clinical guidelines. 13. Is this test effective? 14. Is this therapy effective? 15. Is the intervention cost-effective? 16. Context specificity: how was the study performed? 19. Teaching evidence-based health care.